Drobo 5C is designed from the ground up using drobo’s beyond raid technology to be an affordable, secure storage array for everyone. It includes the state-of-the-art USB Type-C connector for a simple way to attach the Drobo and computer. Drobo 5C, a 5 bay storage array with a 64TB volume size, protects data against hard drive failures and sudden power outages, while also using advanced self-healing. By creating a second volume it will protect your computer’s operating system and application files. Drobo doesn't just protect against drive failures, but also from potential data loss after a power outage. 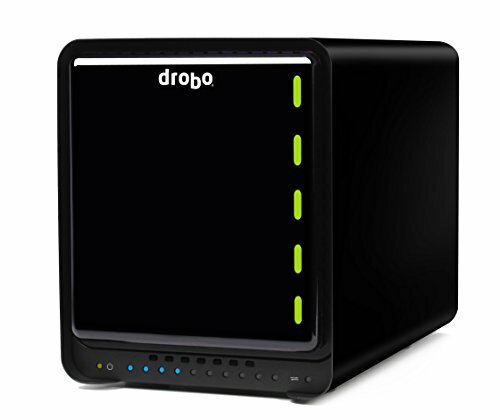 Drobo 5C includes advanced battery backup technology that protects data in memory or cache. This battery recharges itself and is designed to last for the life of the product. During a sudden power loss, Drobo protects in-progress operations by saving in progress operations to an internal SSD. The operations are resumed and written to the disks once power is restored. This ensures important information is safe and sound. The battery recharges itself and is designed to last for the life of your Drobo. Lights on the front show alerts of what's happening, easy as reading a traffic light. Green, Yellow or red lights show the drive status. Drobo LED lights can also be dimmed to reduce light pollution in photo and video editing environments. By correctly connecting the ends of the cable, the performance speeds can be seen as advertised.